Please welcome the newest agent on the Kasmann team, Anne Reynolds, who comes to us from Bucks County, Pennsylvania. Anne has always enjoyed the flexibility and challenges of working for small businesses, and in 2013 she joined a fledgling insurance agency in Pennsylvania. She has held a Producer’s license for three years, and specializes in Personal Lines here at Kasmann. Anne grew up in the suburbs of Philadelphia, enjoying playing piano and cello, reading, and gardening as a child. It wasn’t until she discovered horses, however, that she found her first career calling. 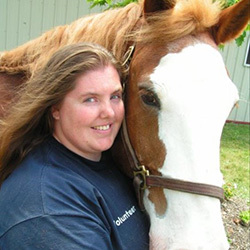 By high school Anne was a certified barn rat, mucking stalls and teaching lessons to earn riding time, later coming to William Woods University in Fulton to earn her Bachelor’s Degree in Equestrian Science. For ten years, Anne managed a therapeutic riding program in Pennsylvania, where she joined her horse knowledge with a passion for teaching and helping others. Anne’s drive to educate still inspires her in her current insurance career. She uses her extensive knowledge of insurance, coupled with years of teaching experience, to make policy language and coverages understandable to clients every day. She firmly believes that an educated insured is a happy insured, and we couldn’t agree more! Anne is thrilled that she heard and answered the Midwest when it called her back out here in April 2016. Her boyfriend William, Chow-Shepherd mix Avi, and black cat Nikolai are looking forward to purchasing their first home in 2017. When she’s not planning future gardens and chicken coops, Anne enjoys re-learning the piano, playing with friends’ horses, and baking dog treats. We are pleased to have Anne as part of our Kasmann team. Her insurance knowledge and people skills will be vital to our sales force as we continue to provide clients in Columbia and Missouri with the best insurance service and products. Be sure to “Like” us on Facebook for links, tips, and to learn what’s new at Kasmann Insurance.